Second and supposedly final trailer for Kong: Skull Island, which was first presented in 60fps on Jimmy Kimmel Live. 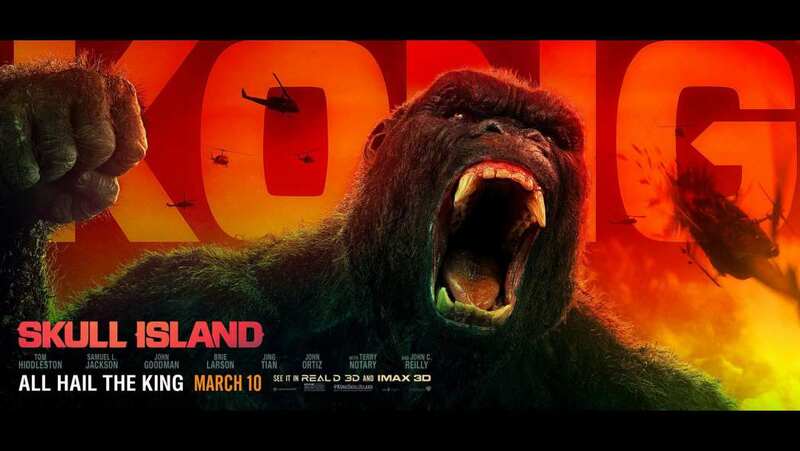 Warner Bros. Pictures and Legendary Pictures’ Kong: Skull Island reimagines the origin of the mythic Kong in a compelling, original adventure from director Jordan Vogt-Roberts. In the film, a diverse team of explorers is brought together to venture deep into an uncharted island in the Pacific—as beautiful as it is treacherous—unaware that they’re crossing into the domain of the mythic Kong. If there is one thing that the posters and now both trailers do, is show off just how huge King Kong is. And how big is that? Well, to give you a sense of scale, Peter Jackson thought his version of King Kong was big at 25 feet tall. This version of the giant gorilla stands, wait for it, at 100 feet! While that is huge, the number is not as large as the 125-foot version that existed in some Japanese versions. When it comes to King Kong's overall design, the production team went with a mixture of the 1933 original and the Japanese version from the 1960s. Director Jordan Vogt-Roberts also added his own touch to the creature, explaining that he wanted its look to be simple. And just how simple? Well, his answer is actually pretty er, simple. He explained that it's size and shape would be so iconic, that a third-grader with limited drawing skills could at least make him recognizable. But, as I said before, he just had to be massive. While the first trailer showed very little of our title gorilla, this feature look is not holding anything back. What I like is how the preview starts off like a throwback, Vietnam war movie. Love that! But then we hear, "Is that a monkey?" Boom, let the destruction begin. But, even with the thrills, Warner Bros was sure to introduce a quirky touch, and a bit of a spin, on the tribesmen we were bound to meet. And speaking of someone to meet, say hello to John C. Reilly! Though his character remains nameless, it is his character who gives us the important exposition. And what is that? Well, we once again find out that Kong is not such a bad dude. Especially when compared with what else is out there. Hashtag Me-likey!